People kept asking…”did you ride your bike today?” Monday I answered no. Tuesday I could say I’d probably ride Wednesday. By the end of Tuesday I had turned the question around and started asking people how they got to work. This brought out a few not necessarily happy responses. I'm musing heavily on that today. I think it has a lot to do with what's normal and who gets to decide what normal is. Turning the question seems to turn normal around too, which is um...not normal. I have a friend who says normal is a setting on your dryer. My 35 minute ride was 55 minutes. I walked through some of the deeper stuff. I think I’m going to need a lighter gear on the winter single speed. A new temp guy at work, he just started, saw me near shopping central. At that point he’s thinking “look, crazy guy.” Imagine his surprise when, 30 minutes later, he’s out shoveling snow and I arrive. "Yes, that was me. Yes, it's exercise, I'm not so sure I'd call it good exercise." I wasn't the only set of bike tracks on out there. I didn't see Full Face Helmet Guy, but I hoped some of the tracks were his. Work closed early again today. It snowed. I caught a ride with The Wife. The YakRack locks were frozen. The snowy bike went in the car. The snowy parts melted. Bummer. Sunday began with rain and the promise of an imminent winter storm. It’s tough to turn rain to snow when the day’s temperature starts at 51 degrees. It rained all day and all night. I can’t imagine how much snow there’d be if temperatures would have been somewhat close to the 15 to 35 normal range. Monday began with rain and the promise of an imminent winter storm. At 8am it happened, the rain turned to snow. I chose the bad weather bus park/ride option to get to work. At 2pm the announcement came, they were sending us home. As I packed up to leave it occurred to me that I might be a tad underdressed to stand on the street peering into 25mph blowing snow hoping for a bus that increasing felt as though it may never come. Just as I pulled out my phone to receive assurances that the bus system was running, out of the flying snow my bus appeared. Phew. As we approached the end of the line the driver became pretty excited about the crazy weather and helping all his passengers make their connections. He already had one bus holding uncomfortably long at the park/ride when he picked up and took action for a second passenger who wanted a bus that had already departed. Along here I noticed a guy walking along the road. I noticed him because he was wearing an ICP hoody. I always notice ICP hoodies. I thought maybe he looked at my bus and wished he was on it. The driver stopped just long enough alongside the waiting park/ride bus for us to get off and then began to pursue the bus for the second passenger, forgetting for a few moments that he also needed to pick up passengers. He must have realized his error when he looked in the rearview and saw passengers scattered in his wake in various stages of shock and disbelief. He stopped, blocking the path of the still waiting park/ride bus, and they all ambled across the parking lot and boarded. Heh heh, crazy weather. I found my driver door frozen shut. With a small amount of coercion the downwind passenger door opened. I began to scrape windows and noticed ICP Hoody Guy was approaching me. He had a hastily scribbled San Luiz Ave address on a piece of paper and wanted help finding it. I wasn’t familiar with that road and invited him to the warmth of the building where we could call The Wife to Google Map it. Dial once. Busy. Dial twice. Busy. He pulls out a phone number. Well, now we’ve got something we can use. While he calls the number and begins to discuss his destination and location in Spanish I begin to muse on the ideas and lessons of risk and race presented in the movie Crash. As he’s looking out the windows identifying landmarks directly across the street I become simultaneously aware of two things: one, San Luiz Ave is South Louise Avenue which is the road we’re on, and B, I’m an idiot. I check out his hoody, ICP it’s not. Jokers Wild it is. I don’t know what that means, but there’s just something really cool and creepy about well drawn frowning clowns. Jeans, typical. Feet, sandals. That crack you heard was my jaw bouncing off the floor. Sandals! This guy is a tad underdressed. He finished his conversation. It was clear that he knew where he was going and that it was within a block. Off he went. Today I was out from behind my metal and glass and was called friend by a blizzard walking sandal wearing Spanish speaking complete stranger. There were plenty of car trips to take this week with the Thanksgiving holiday and family in town. Friday was especially heavy with The Wife at work and me home with The Boys and haircuts and lunches and parades. My total bike miles were aided by a very special LBS Thanksgiving Day Ride. I rode to the ride but was unable to complete the round trip by bike. The 20 degree temps, 15mph north wind, and body heat generating exertion levels governed by the group (as opposed to being governed by my personal need for warmth) broke me down. The Owner was kind enough to drive me home. In the past few days I’ve managed to take a few articles off my “to be read” pile. Most interesting and exciting was “The New Power Generation” by Daniel Pink @ Wired. This article features some couples and a Chicago restaurant that have begun powering their homes and businesses with solar and wind power. Pink helpfully includes some of the dollar amounts involved in switching to alternative power; both the upfront costs and what might come back in savings, grants and rebates. Tyler @ the Clean Break blog (I LOVE THIS BLOG) posted highlights of Hillary Clinton’s address to the Cleantech Venture Forum VIII. Finally Will Wade AT…yup, Wired.com writes about Southern California Edison and San Diego Gas & Electric and two solar powered projects they’re planning with Stirling Energy Systems. These projects will be in the California desert. "Without question, this will be the largest solar project in the world," said Gil Alexander, a spokesman for SoCal Edison. "It will be bigger than all U.S. solar-energy projects combined." Right now Evergreen Solar is the star of the portfolio. Its $126 gain offsets much of the $151 loss from the other three. Here’s a nice review of the solar power industry in this article by Joanna Glasner at Wired.com. In a single paragraph she mentions all four of the McASP stocks. She also mentions the Sunpower IPO which occurred on November 17. It made pretty big news with a 40% gain on its first day. Is solar power tbe next .com? Monday was a quintessential MinusCar day. I needed to swap some boxes of fundraising popcorn with the Cubmaster at his home. These boxes too bulky to carry in the bag. His home is a block off the route The Wife often travels to and from work. In the morning I loaded her car with the popcorn. For lunch we met in her work parking lot. I put the bike on top of the car and traveled with her to make the swap. After that I pulled the bike off and she continued home. I went for a lunchtime ride. Tuesday I had to stay at work late. Staying late and having an evening meeting already scheduled meant calling home and being written off for supper. THAT gave me a few extra minutes to ride IF I got the work done. I got the work done. It was completely dark when I departed work. I headed to the local bike path where I enjoyed my ride while chasing rabbits with the helmet mounted light, and seeing all the little critters eyes reflect back to me. Blink, blink. I love night riding. I made it just in time to the meeting. I attended in full bike regalia; no doubt smelling of sweat and the outdoors. 50 miles in two days. In November. A November article in the local daily announced the good news that high gas prices have brought to local mass transit. September ridership was up close to 20% over the previous year. That 20% improved year to date riding by 3%. I guess as gas prices creep back down the numbers have gone back to normal. I was pretty lonely on the 15th. These numbers reflect the dropping temperatures. I can no longer pick The Boys up at the end of the day on bicycles. I still do most of my own transport by bicycle. This week I barely managed to bicycle more than drive my car. Monday and Tuesday were days of the wet and rainy variety. Monday I strait drove to work and ran some errands in it during lunch. Errands included taking The Single to the LBS for studded tire and fender installation. I drove lots of single occupant miles this day. Tuesday, to get to work, I did the rain option of driving to the park/ride and taking the bus. I found the 11/16 ride pretty difficult. It’s Friday already and I haven’t reported on last week. With The Wife out of town it was my turn to handle the daily drop offs. Three days of heavy vehicle use and not so heavy bicycle use. Weeks like these make it painfully obvious how difficult The Project would be without my willing teammate. 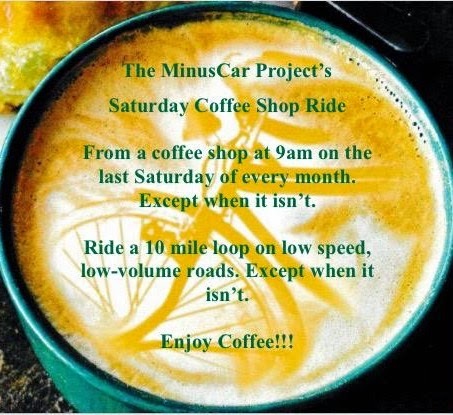 The MinusCar Project acknowledges the reality that it cannot be about "no car garages." It absolutely can be (and is) about one car garages, or even about cars being parked in driveways more often than being driven on parkways. Today was a much better cycling day than yesterday. I suspect yesterday I may have found a limit to the temperature and windchill that I’m willing to endure. Further testing is required. This morning I saw two 16-degree commuting cyclists. Full-face Helmet Guy was one of them. I noticed he's adorned ski goggles. If it’s good enough for him it might be good enough for…today I received an e-mail from Smith Optics. I can win some! Providence? I added another set of bicycle tracks to the snow on my morning commute. That makes two sets of tracks, me today and me yesterday. Three people at work have noted I’m still riding to work. Two of them encountered me on the road and thought I was pretty tough. “Why yes, yes I am. Thank you.” I’m always sure to thank them for not taking the opportunity to run me over. One of the three admitted that he’d figured I’d for sure give up by now. A hidden pitfall of cycling to work: the afternoon trips for lunch are more difficult. I had gotten used to walking a few blocks for lunch. When I ride to work when it’s this cold I don’t have an appropriate coat for trips to lunch. It’s easier to get back on the bike and ride far away for lunch than to change into neoprene and walk down the street. Then I went to a picture framer. Then I went to pick up some embroidery work. A few weeks ago The Owner loaned me his Timbuk2 messenger bag. I immediately loved it! Previously I had been using a backpack. My two favorite things about the new bag: when looking over the shoulder for traffic I don’t have to look around the backpack and the bag doesn’t fall off my shoulder when I’m off the bike. I can’t believe I haven't switched to this already. Messengers know a thing or two about urban cycling, duh. The Owner is a good salesman. I customized and then bought my own from him. Then I took it somewhere else for the embroidery. With all these stops there were plenty of people to suffer the shock and awe of a person on a bicycle at below freezing temperatures. I admitted to the dental hygienist that I have a strong commitment to using a car as little as possible. I mentioned I’d filled up with gas three times (it might be four) since June. Her response involved the money saved from not buying gas. If minds begin to change about global warming responses will likely tend toward the idea of limiting green-house-gas emissions more often than money or health, or simply how crazy it is that a person rides a bike for utility. I wonder if that day will ever come. A light snow began falling toward the end of my errand running. It was a perfect ending to a very good cycling day. Upon arriving home I changed clothes and headed out on foot for school conferences. I enjoyed an ice cream novelty on my way. It reminded me of the “it’s so cold the Eskimos are sucking on icicles to keep warm” joke. I almost fell three times on uncleared sidewalks. Add this to the reasons I don’t ride on sidewalks. …it will go wrong when it’s most important for things to go right. Feet: normal socks, wool socks, shoes, neoprene booties. This won’t work for rides much colder than this one. The next level of warmth will come by replacing clipless pedals with platforms and wearing actual snow boots. Legs: padded briefs, poly tights, neoprene tights. I can probably go a few degrees colder. Torso: thermal undershirt, thermal jersey, neoprene jacket. This could work for another 10 degrees, maybe more. Hands: windproof liners, windproof fleece. This could work for another 10 degrees. Head: balaclava, helmet, sunglasses. Eyewear is an issue because it’s the only exposed skin. Ski goggles have been recommended to me but I’m not ready to do that. I found the balaclava comes with some vision limitations. Altered placement for rear blinky, to accommodate newly installed rear fender, interferes with legs. Will adjust later. Newly installed very cold plastic front fender breaks on first bump that fully compresses the front suspension. Come to realization that sunglasses got tossed when the bag strap detached. Turn around and ride back (with the wind, ahhh) to find them. Thankfully I hadn’t run over them. Arrive at work to find newly configured bike with studded tires and fenders exceeds maximum cable lock functionality. Change clothes and enter building possibly the only sweaty person in the city. The ride home is going to be very cool, erm, nice. Less wind, and a few more degrees could feel tropical. And it’s going to be post sunset. Bike lights dancing on white snow. I think I’ll ride what passes for urban singletrack tonight to make it even more special. I was a day late. Monday I drove The Single to the LBS for studded tire installation and fenders. Fenders will be a new thing for me this year. Tuesday the wind cranked up to 30mph and some snow flew. The Single wasn't complete and I don't usually start rides in precipitation so I did the rain option bus ride to work. On the way home I picked up the bike. Tuesday night we found The Boy 7 in a boot and snow pant deficient way. The remedy involved yet another trip in the car. We learned we weren't the only people unwilling to shop for these items in 50-degree temperatures. Three stops later we found a store with a remaining selection. The salesdude said boots started moving 24 hours ago and they were about out now. The previous stop, Target, was essentially already out. This morning's ride to work will be a true winter riding experience. 12-degrees, 24mph wind. It's going to be difficult to dress because it's going to be difficult to move from 30 wind-chill to -8. I would have preferred a couple 15-degree tests. A few weeks ago I joked with some MinusCar Project aware co-workers about getting me a watch-type device that monitored global temperature. A couple days ago I was Googling Steven Moore's "War Against the Car" article and found the people over at JunkScience.com have one. So go there and as an added bonus learn why global warming is based on junk science. Stephen Moore from the Wall Street Journal would like you to know that I'm "childish" and part of a "modern day Luddite movement." Go here to learn just how crazy I am. Thanks to Oil/Sissy Blog (as usual) for featuring this article first. I don't know where Mr. Moore sends his kids to school, but my second grader has no similar notions. Mr. Moore might focus more on that particular teacher than a so called "Green indoctrination." By the way, what was that shocking number Mr. Moore? One? Two? And what do YOU think the worst invention in history is? Why yes, yes it has, hasn’t it. I’m glad we agree. Are you schizophrenic? In the rest of this article you argue heavily against yourself. If by left you mean me, this guy, and the 14 bus riders in my city, then you might be right, although I suspect 13 of the bus riders are just trying to get to their job. Anyway, we’re not a big bunch, and most of us are poor and uneducated so you can probably rest a little easier than you apparently are. If by left you mean The Left, you're wrong. This is exactly what I've been thinking! Sheesh, I thought this was going to be an argument! What do you say you and I give carpooling together a try next week? I'd like to see you have the argument with David Hilfiker, a man who’s humility suggests to me that he knows something you’ll never understand. Is that the liberation you speak of? Yep. And they went to the suburbs. Maybe this is the liberation you were thinking of. An idea so crackpot a Republican Congress and a Republican Executive signed it in to law. Apparently you haven’t been reading The MinusCar Project. There are guys parked outside my house. They’re in a black Suburban with very dark tinted windows. “Big Oil” is painted on the side of the vehicle. They’ve been there since June. I’m going to show your article to them. Hopefully when they read that you’re lumping them in with liberal, Green, childish, environmental Luddites they’ll leave and go sit outside your house. My understanding is that McDonald’s will be putting nutrition information on their packaging in the near future. That's pretty darn close to advising Americans to eat fewer hamburgers if you ask me. The pot calling the kettle perverse! To this I plead no contest. I was just kidding about the Suburban outside my house. "Big Oil" isn't really painted on its side. The Wife comes home tonight! It's a good thing. I just screwed up grilled cheese sandwiches. Cut me a little slack though, I burned two beyond recognition but the third, for The Boy 3, was coming out perfect, until I flipped it with the same spatula as the other two. That's the wheat/butter spatula on the wheat/dairy free grilled cheese. Have you ever seen a wheat/dairy free grilled cheese sandwich? Two doh's! and a no! I served The Boy 3 his supper while he continued to play. At one point he forgot what he was doing and picked up a piece of Playdoh and put it in his mouth. He wasn't happy about that. Tonight we're gonna see if he can walk and chew gum. Active social lives are keeping these numbers high. Two single occupant trips, both for end of day picking up of The Boys. A popular argument, excuse, reason or obstacle against riding a bike to work is the distance between a person’s residence and their work. The I Live Here and Work There Argument is pretty persuasive for a lot of people. Just like The George Bushes declaring the American way of life non-negotiable, people also claim their right to live 30 miles away from the places they travel to the most. Famous pessimist James Howard Kunstler sees an interesting future for our soon to be energy starved world. He holds very little hope for suburbia, and suggests that life will soon become “profoundly local.” If Kunstler's a bit too dark Oil Is For Sissy’s happily points to a more palatable November 5 Star Tribune article. Any similarities to Kunstler’s future and the Strib’s present might not be coincidental. 27 years ago my parents cashed in their portion of the American dream for a different dream. We moved to this town and began living profoundly local. The home we moved to was smaller and three blocks from dad’s work. He walked or biked year round for 20 years. It’s amazing to me that as I meditate and ponder all the issues and concerns I face while living out The MinusCar Project, my parents have already modeled many of the answers. My dad no longer works the same job. The house my parents live in is much further than three blocks from dad’s work. My dad rode his bike to work as much as I did last week. He says I inspire him. My dad turns 62 today. Happy Birthday Dad. You’ve been modeling the right things for me even when you couldn’t possibly have known how right they were. Thanks. I am a lucky man. Friday provided a fitting end to a harrowing week of cycling. I hooked up with Rotsap and LBS-Chad for a lunchtime recreational ride. I haven’t been on a recreational ride in a very long time. The ride ended up reinforcing just how unlucky I’ve been this week…except that, by the end if Friday I realized it had been a really lucky week. I rode the newly forked race bike to work in anticipation of the possibility of a lunchtime ride. By the 11am start time I was knee deep in work related mayhem and made arrangements for the ride to come by in an hour. I snuck out the back door and we headed downtown for a quick chat at shores of the city namesake. A short distance later we admired the BOOM banner placed on the long abandoned soon to be razed downtown feed mill. We rode on enjoying the camaraderie that comes with group ride formation on the local trails with trusted biking buddies. And then disaster struck. I was standing and cranking up a short steep section and my chain snapped. My weight pitched precariously forward and I briefly performed an impromptu nose stand. Fortunately for us Rotsap had part of a Cool Tool™ that we coupled with a wheel skewer to reconnect the chain. And off we rode. And then disaster struck. I flatted. Fortunately for us Rotsap Evad had 10 year old Park Speed Patches and an Innovations Big Air that was first punctured last August. There was just enough air to continue the ride, and the patch held. Rotsap departed early and then disaster struck. We hit what passes for urban singletrack in this town and found a fallen tree limb blocking the path. We decided to perform some trail maintenance, and soon both of us got taken for a ride by the limb as it fell into the river. A little sore and a little shook, we continued to the end of the ride. It wasn’t till the end of the day that I realized just how lucky I had been all week. I had three serious incidents with cars, and two opportunities for injury on Friday’s ride. What made me realize I was lucky? When I got home after meeting all the family related Friday night obligations I put the bike away and found the front tire was completely flat. The patch had held just long enough for me to do what I needed to do. It's hard to account for everything, which is why rules for safety matter. Here’s a rule: don’t pass on the right. Like good art, if you learn the rules well, then you’ll be able to find the best ways to break them. At red light intersections, when I intend to turn right, and traffic is backed up, and the lead car is blocking the way for any other cars that would otherwise turn right, I (with varying levels of caution) can’t resist passing on the right and making my turn. This morning I did that. This morning at a red light I passed a single vehicle on the right. This morning the passenger door of that vehicle opened. This morning I was lucky, there was no contact. This morning, if someone was trying to teach me a lesson, I learned it. This situation is written here as collision #3, the part that applies specifically is in the final paragraph. In other hot car bike action, Wednesday while I was getting right hooked in the northern plains, Fatty was getting right hooked in the northwest. He didn’t come out quite as lucky as I did. Go here to read his story. I think the conversation in the comments has high potential to be very interesting too. "Still, this afternoon’s high temperature will be above the average for this time of year. Unbelievable, huh?" - from this mornings e-mailed forecast from Shawn Cable. It hasn’t rained or snowed for a long time, so that hasn’t pushed me onto the bus either. Thursday last week I waited at a designated stop to take the bus downtown. My first ride in almost a month. The Wife and I were meeting for lunch. This day I came to realize there is something worse than standing idly on a busy street waiting for a bus. It’s standing idly on a busy street waiting for a bus that then refuses to pick me up. The driver pointed up the street and held up two fingers. Assuming I had the stop wrong (and knowing I didn't), I half heartedly ran half a block hoping that maybe if I showed a little hustle he’d wait. He didn’t. So I met The Wife by bike at a quaint little café. We were a very mismatched couple, she in her professional gear, and I in my biking regalia. I e-mailed my story to the transit company. They were pretty quick to respond that things have been corrected. I’m sorry to the driver, it will be interesting next time I board his bus. I’m also sorry to those that have been boarding two blocks up...they're sure going to be confused when their stop disappears tomorrow. Record highs expected today. I'd like to know of at least one television weather person who is as uneasy with record highs as I am. I figure odds are pretty good that if such a person did exist, and this person was still allowed on TV, that they'd be in Portland, Oregon. Today's ride to work was more adventurous than usual. I hadn’t gone two blocks before getting brushed to the side of the road by a school bus. This could be fun, the school bus has a route and the route goes by my house. I can see this bus every day if I time my departure properly. As our relationship blossoms maybe we'll both understand a few things we didn’t know before about vehicle traffic. After all, we are professionals aren't we. A few blocks later, and not a minute after the bus and I parted ways, I got right hooked (collision type #4). No contact, but it was the worst right hook to date for me. I saw it coming a block before the driver did so I was reasonably prepared with the proper evasive action. Living in a town my size sure is great! Half the people running you over are people you’ve seen other places in the community. This one picks up his kid from school sometimes the same time I get The Boy 7. I already know from that, he’s not someone I want to mess with. Speaking of communities this size, when I was out on the prairie this morning I saw a progressive. I sort of thought I’d seen him once before in the area, but there was no doubt THIS time. I didn’t even know he lived around here. Full-face-helmet-guy and I continue to hold each other accountable in the mornings. It’s not the same ride when he’s not there. Another guy has joined the fun. I’d seen him a couple times in a row in the evening, and found him this morning too. Welcome to the fun, purple-shirt-guy! This guy experienced the pleasure of a MinusCar sighting on Monday. I made a lot of car trips this week. The temperature and time change makes it unreasonable to pick up The Boys at the end of the day by bicycle. On my pickup days I ride home, get in the car and pick everybody up. With the weather change I’ve suffered my first cold of the season. Mostly I’ve been riding through it, but early in the week between two very short nights, I drove to work.